It’s never a bad time to buy a new pot pipe. So whether you’re on the lookout for a new marijuana pipe, bong, grinder, or cannabis-themed gifts for friends, Greenside Glass has you covered. And if you’re looking for something for yourself, well, let’s face it, you can never have too many pipes! 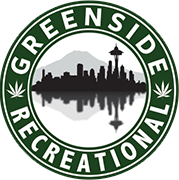 Once you’ve picked out the perfect smoking set-up for yourself, stop by Greenside Recreational Marijuana just next door, and stock up on the best marijuana strains in Washington State. Order online and we’ll have your stash ready for same-day pickup. Greenside Glass is located at 9804 Lake City Way NE and is open Monday thru Saturday from 9am to 6pm, and on Sundays from 10am to 6pm. We’ve got a huge selection of bongs, pipes, one-hitters, and other amazing cannabis paraphernalia for you to browse. Check out more of our collection online! Or stop by our shop to see everything we’ve got. Next Greenside Recreational’s August Vendor Spotlights: Solstice and Sweet As!